Time and Again is told in the first person by Simon Morley, a 28-year-old artist working in a 1970's Manhattan advertising agency who is approached to join a covert government operation exploring the possibility of time travel. Recruited as having the right stuff, Si begins to learn about the project and its goals. Initially recruited to explore San Francisco prior to the 1906 earthquake, Si manages to convince his superiors to allow him to investigate 1880's New York. Simon's motive for choosing New York is to witness the mailing of an envelope. An event Simon hopes may explain a family mystery of his girlfriend Kate. Unlike most covert projects involving time travel, this one does not involve any hi-tech machinery. Quite the contrary, the project director Dr. Danziger believes that the past is just outside the window and that you only have to free yourself from the present to step into it. Through mental conditioning, such as familiarizing the candidates with the past and through self-hypnosis, Dr. Danziger plans to project his subjects into the past. As Simon becomes more adept at his training he eventually steps into the past and begins an adventure of a lifetime. Finney's eye for detail and his ability to weave historical fact seamlessly with his fiction will have you believing that Finney travelled through time himself to bring this tale to life. Finney describes in rich detail the architectural history of New York City, comparing cityscapes of modern day New York to those of 1880 as seen through the eyes of Simon. As with Finney's short stories (See About Time - Short Story Collection) his ability to see the theme of time travel in a new light is awe-inspiring. In Time and Again Finney expresses the inability of the average modern person to be able to think of the past as living and new. We think of it as faded and old. Through his training Si is taught to stop seeing the past as black and white photos or antiques and imagine the past as being alive and vibrant. This, among other exercises, allows Si to let go of the present and slip willingly into the past. While I personally took a great deal of interest in the architectural and historical detail Finney manages to incorporate into the tale, I am not sure whether others would find the amount of detail fascinating or just tediously boring. Strangely enough I found the mystery that was supposed to be at the heart of the story to be the least interesting thing about the novel. At times I felt as if the mystery and intrigue generated by the plot were detracting from the real focus of the story - New York City. My only other complaint is Finney's depiction of the 1970's portion of the novel. Simon's attitudes, the fashion of the time and other small references suggested to me a period more befitting the 1960's, or in some cases the 1950's. Mind you, I am not old enough to have lived as an adult in any of those time periods, so I am only going on what I have absorbed through other cultural references of those periods through out my life. Having said that I couldn't help but find Simon, and many of Finney's other characters seem a little too old-fashioned to be set in 1970. I wouldn't be surprised if this is a story that Finney had been nurturing for some time and that it bears the age of author and his reflection on the period of when he may have been closer to Simon's age. When compared to some of Finney's short stories that are set in the 1940's and 1950's it compares a lot more closely to the feel of the time period established in those stories. Of course this doesn't detract from the over all quality of the story, I just found that the modern day setting in Time and Again did not ring as true for me as did the picture of 1880's that Finney drew in the novel. I highly recommend the novel, as with all Finney's works I have read to date, his insight into the past is spectacularly combined with superb story telling. 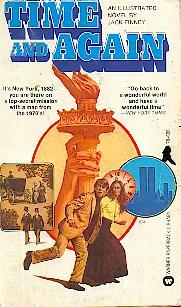 From Time to Time (1995) is the long awaited sequel to Time and Again(1970) and was published shortly before the author's death in 1995. A fan site devoted not only to the story Time and Again by Jack Finney but some of the historical locations mentioned in the novel. Al Tiech's got a great selection of links associated with his article from obituaries on Jack Finney, to biographies and photos of old New York.